If you want to create a successful membership website and business, it helps to learn from those who’ve done did it right the first time. In this post, we’ll show you 12 examples of successful subscription sites across a variety of industries, what they’re each doing right and how you can do the same for your subscription site to achieve similar success. 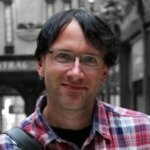 Why Are Subscription and Membership Sites Important? For many businesses, the goal is creating recurring revenue. Without income, you continually need to bring in new business. A subscription/membership model generates revenue over the long run. Many businesses like jobs, dating, traveling, and consumer goods use subscription models. Fortunately, you can follow their example to create a membership site that works for your business. 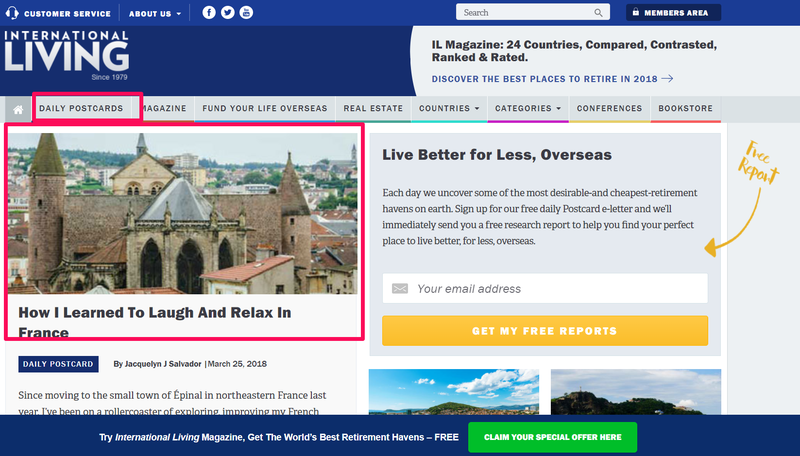 With a site like International Living, the best thing you can do to attract new members is to give examples of international living. The site updates their blog daily with new photos and content from different parts of the country, giving readers an emotional reason to check out their membership. Without a blog, International Living is just another travel site looking to build membership. Instead, International Living uses the blog to whet prospective members’ appetites. All the content drives traffic to the member area to help those who want to live overseas subscribe to a one- or two-year International Living subscription. When you are the premier blogging site on the Internet, your content can be used to draw in prospective members. 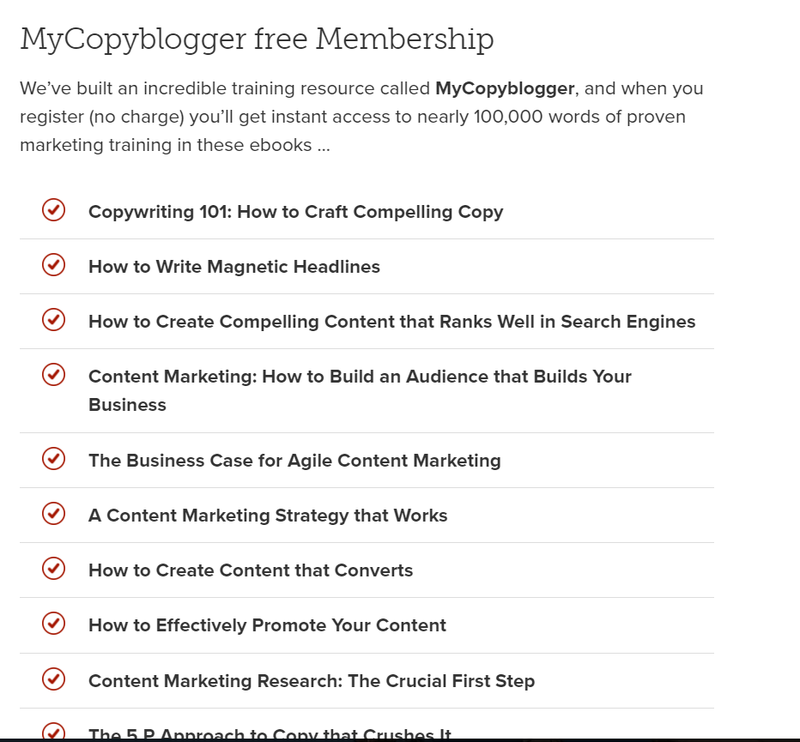 Copyblogger has a veritable treasure trove of free and paid resources on content marketing. They provide access to 100,000 words of proven marketing training for free, including many valuable copywriting e-Books (see below). Draw visitors to your website with high-quality blog posts. Send them to the free membership option where they can access 100,000 words of additional high-quality content. Keep them engaged with user-generated content from the Copyblogger forum. There they can connect with paid members of the community to foster a sense of belonging. The content unites their lead generation funnel at each step of the way as it piques prospective members’ interest in their subscription service. 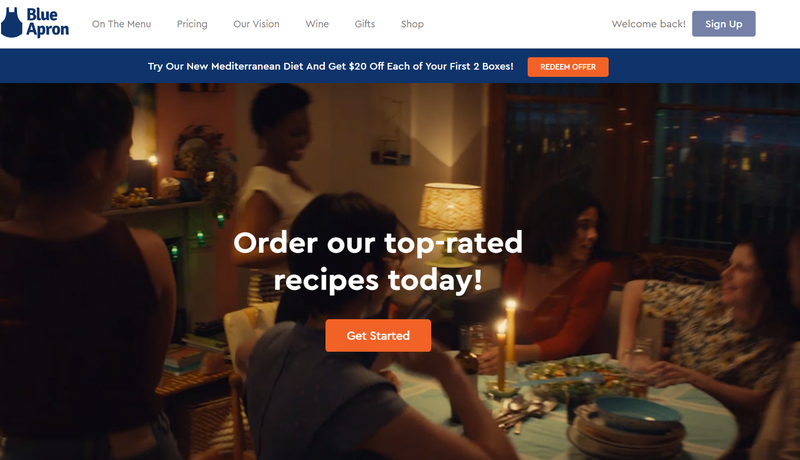 Blue Apron creates an attention-grabbing offer at the top of the page with a prominent “$20 off your first two boxes” CTA. All you need to do is click the “Redeem Offer” button. Additionally, below in the hero image, Blue Apron shows you how easy it is to create meals for your friends, along with five words of text and another CTA stating, “Get Started”. Notice how all the colors on the home page are low-key blues. Even the image is by candlelight. The only thing that pops on the page are the two orange CTA’s. Unlike Copyblogger, which has a longer cycle to get users to join their membership, Blue Apron wants members to join as soon as possible. That is why the food delivery membership uses three different CTA’s above the fold. They use the two orange CTA buttons mentioned earlier and the blue signup CTA button in the upper right corner. Speaking of CTAs, “free trial” CTA buttons have shown to be the most powerful for subscription businesses. Study Gateway provides an easy way for those who want to know more about the Bible to get the information they seek. Statistics from other services show that free trials lead to as high as a 60% conversion rate across multiple platforms. The idea works because people need to trust you before they work with you. A free trial is a form of guarantee. It is something that many training and SaaS companies are almost expected to do if they want to succeed in their space. Before you join Study Gateway, you get a free 7-day trial with unlimited access to over 2,500 video Bible lessons accessible on any device. The free trial from Study Gateway is a brilliant move. Their users already have a bible. Not to get too religious, but the membership needs to know how the site can help them understand the word of God. 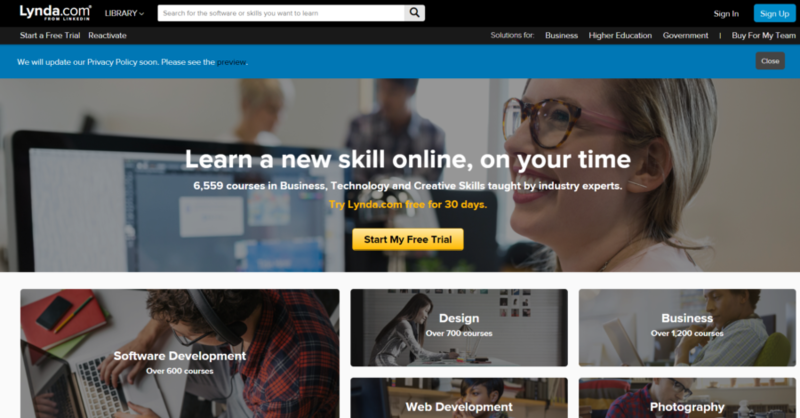 Lynda.com is one of the oldest online professional training sites in the world. To stay modern, one of the things the site did was ensure all their courses are accessible on mobile devices by launching OTT mobile apps (which we’ve found to increase revenue by 30%). Over-the-top apps (OTT) are bringing in a “new age” of video. These apps allow you to stream video from your favorite provider, on your preferred device, whenever you want. 77% of US adults own a smartphone. The high level of ownership makes it vital for Lynda.com to offer mobile video training classes. With 6,559 courses for business, technology, and creative professionals, this is not an easy feat. However, the move helps them stay competitive in the growing online education space. 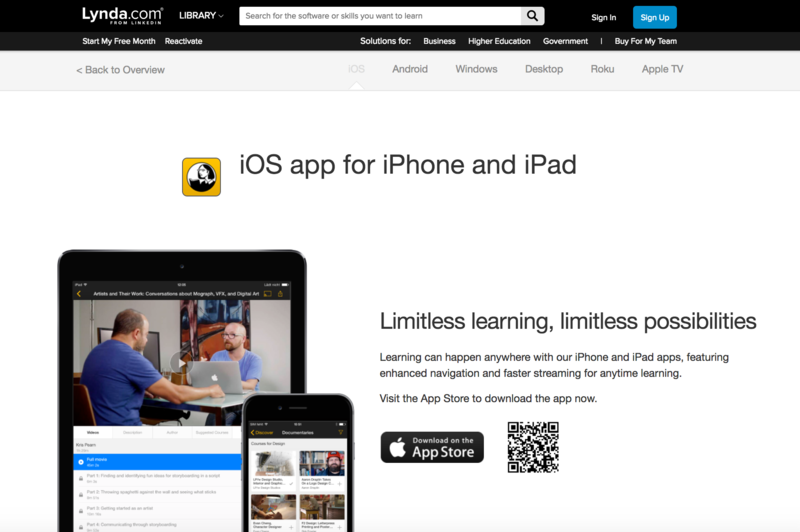 Lynda.com students can now access all their classes on multiple devices. They created mobile apps that students can access on iOS, Android, Windows, Apple TV, and Roku devices. FabFitFun boxes save customers over $200 every season on makeup and other beauty supplies. Their premise is simple and laid out on the homepage. You can pay $49 per season or $179 for the entire year. For women, saving $200 on cosmetics is a huge deal. Statistically, most women in the United States spend $313 per month on beauty products. Everyone loves to save money and know they got a great deal. Finding a way to help members save on everyday products they need anyways is a great way to generate interest in your membership. 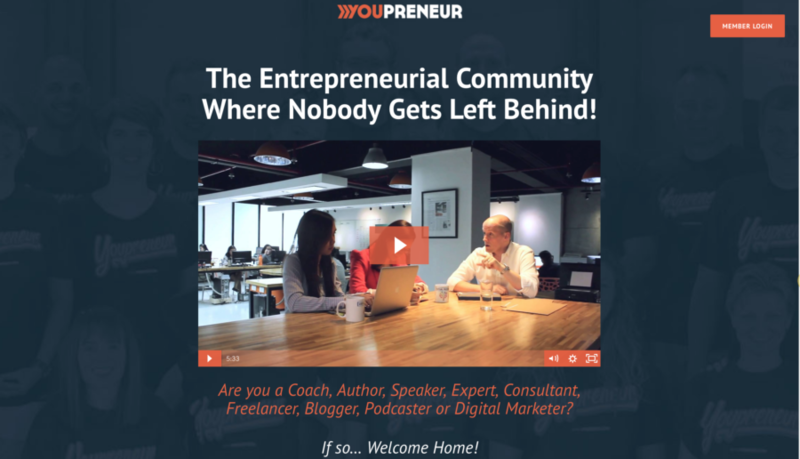 Youpreneur knows their target market. They state it on the home page right below the hero video. They work with coaches, authors, speakers, experts, consultants, freelancers, bloggers, podcasters, and digital marketers. It might sound like an expansive list unless you are an entrepreneur who identifies with one or multiple items on this list. Then it feels like they are talking to you. Chris Drucker’s membership helps work-at-home entrepreneurs feel like they are part of a broader community. Plus, they can invite some of the most successful entrepreneurs on the planet to help you grow your business. Carol Tice is a force of nature when it comes to creating content. As a freelance journalist, she writes for publications like Forbes and clients like American Express, Dun & Bradstreet, and Costco. Her experience led her to create the Freelance Writers Den where she shows thousands of freelance writers how they can make a living doing the same thing. While many look at the membership because of the relatively low price, even more join because of the testimonials. Freelance Writers Den testimonials talk about the jobs they found from the membership coaching and job board. All the memberships on this list use testimonials. 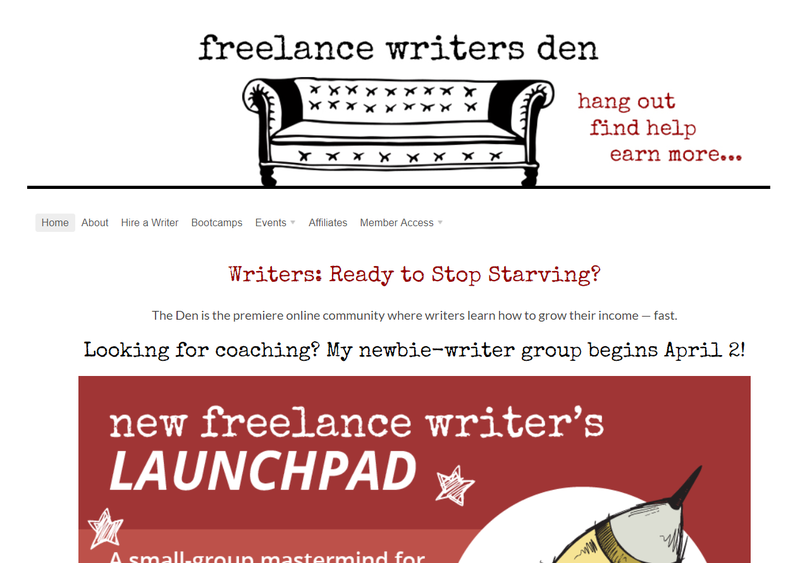 However, the Freelance Writers Den brings in a lot of specific results received from joining. Members testimonials talking about how they profited from the membership increases the trust and authority of your membership to prospects. Because the online subscription model for products and services is still relatively new, you need a quick way to guide users through the process. Birchbox works like Fabfitfun with unboxing partners, gifting, and discounted consumer products. However, there are a few differences. 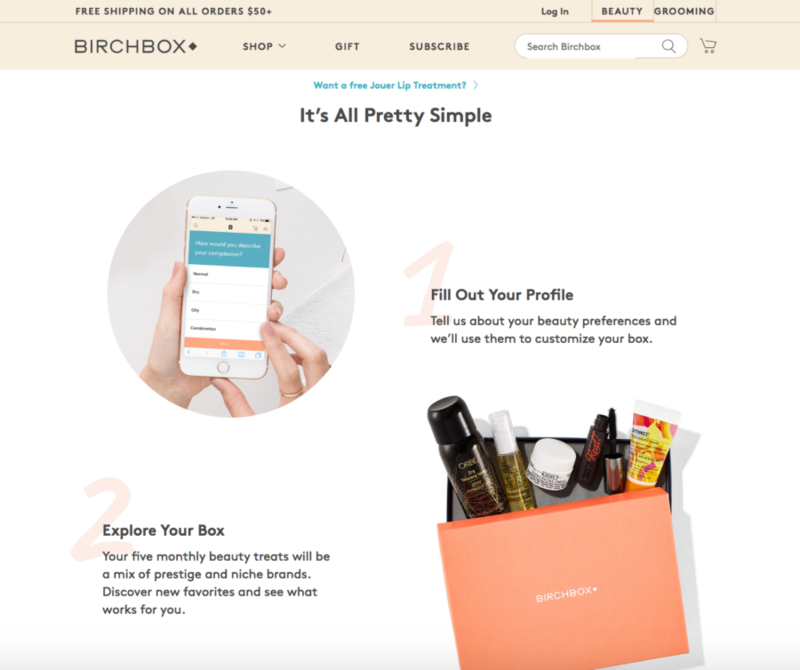 Birchbox does an excellent job showing “how it works” on their homepage. The key is to make the “How It Works” section easy to understand. Many memberships confuse new members. They don’t know what to do or what to expect. You need to make it as easy as 1-2-3 for these members. When you lay out a new type of membership, you need to make it easy for users to learn. If they don’t pick it up quickly, then more than likely they will go somewhere else. Show them how it works, so they stick with you instead. eHarmony always had a different perspective on online dating. While many dating sites allow you to flip through pictures of potential mates, eHarmony focuses on finding your soulmate. That is why the guarantee on eHarmony is fascinating. The hero image shows you the potential to find your soulmate along with a guarantee: eHarmony guarantees meaningful connections or three months of free service. First, the guarantee helps new users trust them. eHarmony understands their market is mostly heartbroken singles who have probably loved and lost and are tired of the grind of trying to find someone suitable. A guarantee gives users comfort. Second, using a specific guarantee will improve conversions. It should be relevant to the desired audience and is added as a benefit to prompt people to join the membership. Third, this guarantee is a win-win because either the user finds a soulmate or has more time to find someone. Either way, it allows them the time to gain confidence in the service and themselves. Memberships that do this might lose a little money in the short run, but they earn it back in the long term. Dollar Shave Club (DSC) has always had a keen understanding of their target audience and how to make them laugh. Their marketing is as comedic as it is informative. 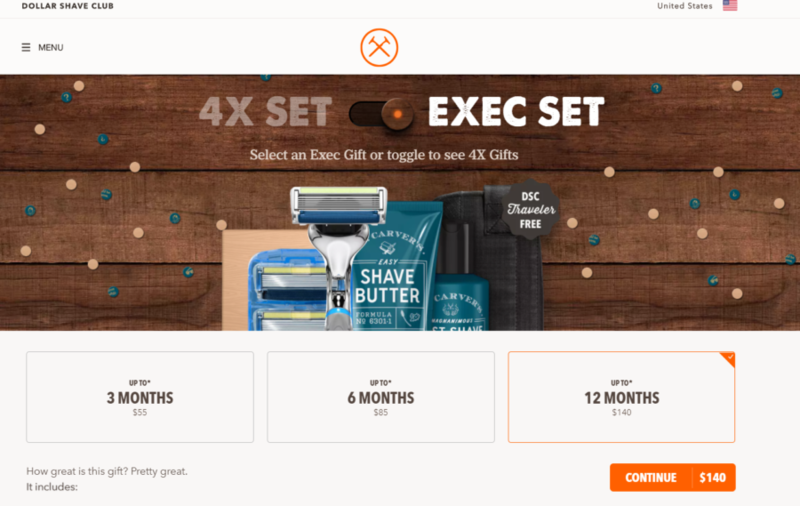 For a shaving company, they go out of their way to entertain prospects to purchase the $5 monthly starter club membership. They know customers who buy this will eventually look at other DSC products like shave butter and Superba toothpaste. Even more importantly, loyal customers can gift free DSC products to others. Savvy sites count on the fact that 92% of consumers trust referrals from those they know. Getting everyday consumer items like DSC can generate a lot of organic traffic to low-cost products. Because of their profit margin, it is difficult to set up large-scale Google AdWords campaigns or other paid promotions. Instead, word of mouth is one of the powerful tools DSC uses to grow their business. 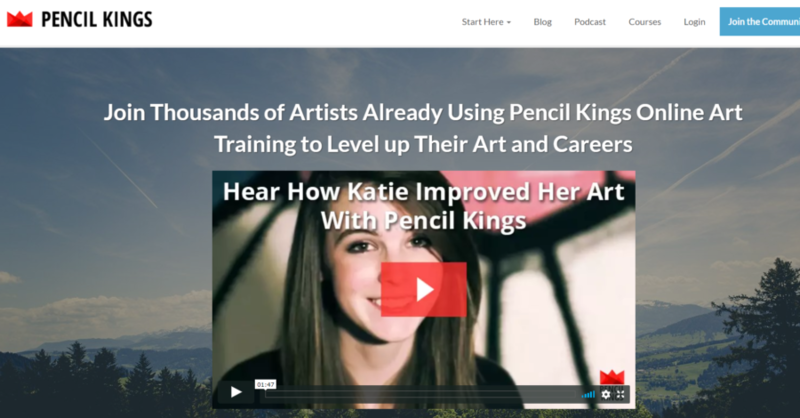 Pencil Kings helps turn your dream of doing artwork into a career. 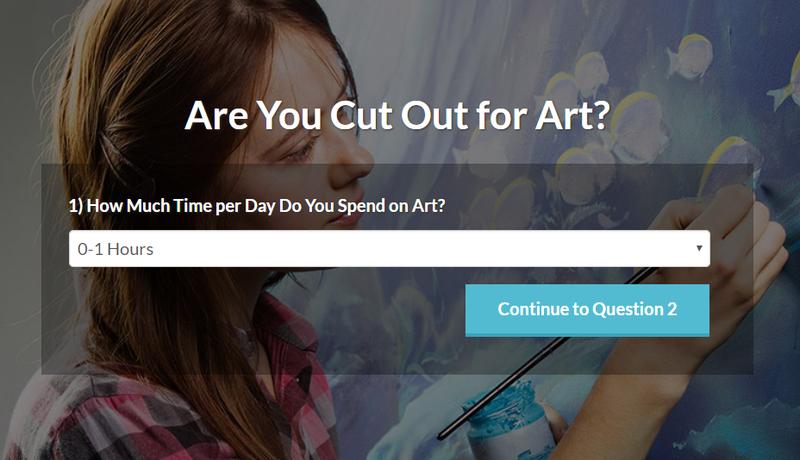 While the site has several great ways to convert, one thing that stands out is the quiz they use to convert prospects. They use a great 30-second quiz to find serious students. It literally breaks down their target market into key demographics, so they know how to sell the prospect later in the sales process. We took the test twice to see if the results would change, which they did, based on our responses. It is a real quiz; not just a marketing gimmick. Also, the survey asks for your email address, so they can build their list. Pencil Kings can send targeted follow up messages through their lead generation campaign that addresses the issues you mentioned in the quiz. If you work with a few audiences, you should consider using this strategy to sell to each group effectively. The quiz helps to self-identify prospects. Hopefully, the examples provided here have given you some inspiration for your subscription site. 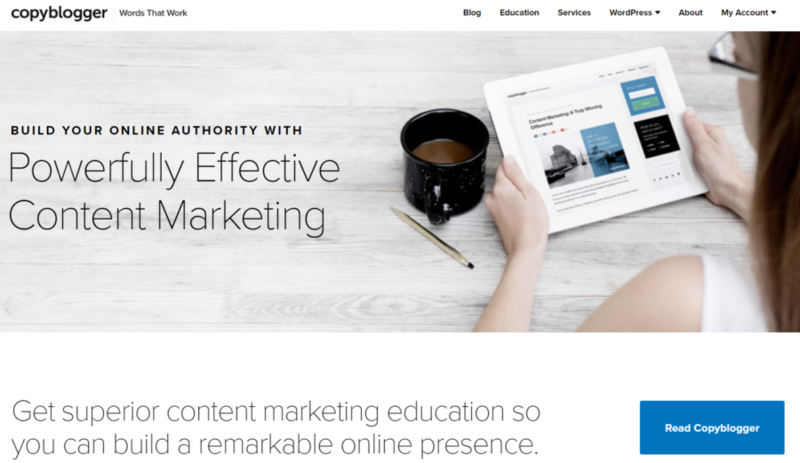 If you need assistance securing your membership content, use Uscreen to help with your content management and learning tools. We provide the technical infrastructure for your membership, so you can focus on what you do best. Finally, let us know in the comments section what you thought were some of the best examples on this list. Did it inspire you with your subscription site? Let us know.